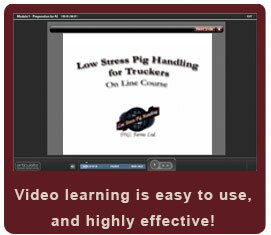 We are currently highlighting our online course, Low Stress Pig Handling for Truckers. This course compliments our in; barn, truck and slaughter plant coaching as well as our classroom training. Details on our other training can be found at www.pighandling.com. Our weekly blog at www.lowstresspighandling.com demonstrates practical low stress pig handling. All of our training courses include exams and Certificates of Achievement. We maintain a registry of all Certified Trainees. We also have access to Pro Training's extensive library of courses on Communications, Coaching, Leadership, and many other aspects of Business Management and Human Relations.